This craft is for children who need to practice using a crayon, glue, and handling small objects. 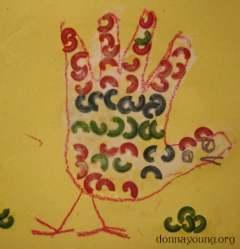 As a parent, I like the hand tracing crafts for sentimental reasons. The one pictured here was made by one of my children during the early 1990's. On the back of the paper - The child writes his/her name and date on the construction paper. On the front of the paper - The child traces his hand and closes the bottom of the hand by drawing a line where the wrist is. 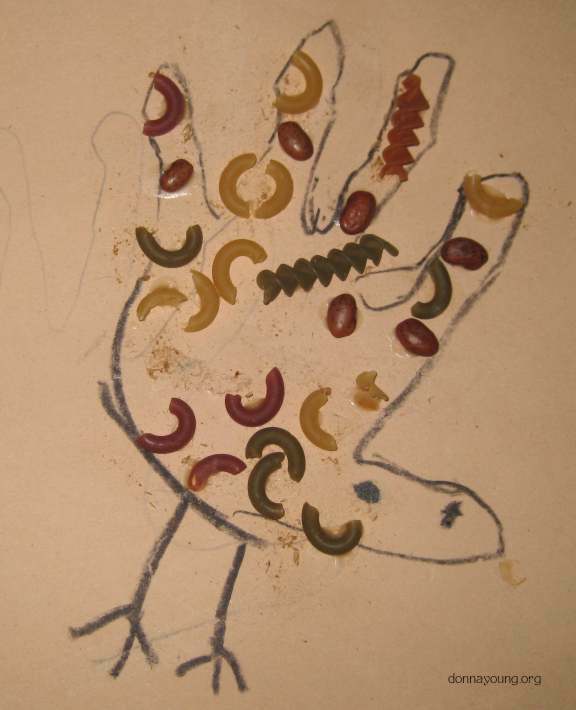 Then he draws turkey legs at the wrist and turkey eyes on the thumb. He applies glue to macaroni or beans and places them on the drawing of his hand. Let it dry for a day. This turkey looks more like a chicken. Macaroni that was dyed with food coloring was used on this hand tracing. Another difference is the hand area is lightened with baking soda (after the noodles were applied). To get the lighter effect-- after the glue is almost dry (or dry), spray the macaroni-ed hand with hair spray, then sprinkle baking soda on on the hand. Knock off the excess after it dries. If I remember correctly, the hand was sprayed and powdered once more with hair spray, then set aside to dry. Animations for DN Style - DN style is very similar to D'Nealian. There are 53 animated letters in this hand drawn set.